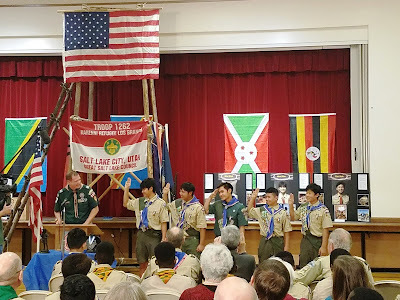 5 young men from Great Salt Lake Council's Troop 1262 were awarded Eagle Scout badges this evening at a ceremony in the South Salt Lake Stake Center. This troop, consisting primarily of youth from Burmese (Myanmarese) refugee families living in Salt Lake, has awarded 29 Eagles in its 10 years of existence. 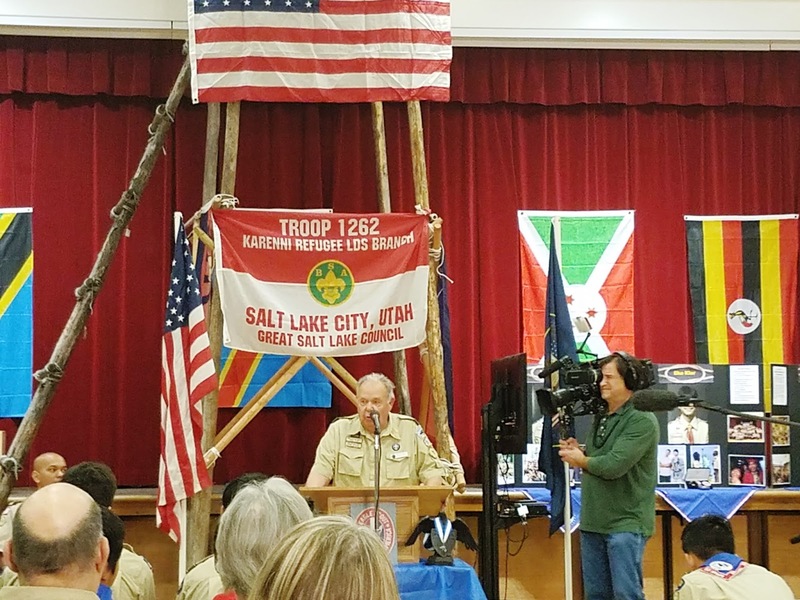 Troop 1262's story is so compelling a four-man crew from CBS has been in Salt Lake for the last several days filming an episode that will air soon on CBS Sunday Morning. The Karen and Karenni peoples are persecuted minorities in Myanmar and a number of them have been resettled from refugee camps on the Thai/Burmese border to Utah. Children in these refugee families often struggle to adapt to US life ways. Ten years ago, Bob Roylance invited 5 Karen boys into his home in an effort to keep them from recidivism back into the Utah juvenile justice system. He and his wife, Susan, determined that what these young men really needed in their lives was scouting. The first troop meetings were held in the Roylance home in South Jordan. Fast forward 10 years and 250 young men are active in Salt Lake refugee troops serving formerly at-risk youth from Africa, Asia, and the Middle East. A delegation of refugee scouts, assisted by Senator Orrin Hatch's office which expedited immigration paperwork, attended the 2015 World Scout Jamboree in Yamaguchi, Japan. The program is so successful that with cooperation from the State of Utah 500 young men will likely be enrolled in Salt Lake refugee troops by the end of 2018. Most of the adult leadership comes from native Utahan Latter-day Saints. Fortunately, adult refugee participation is increasing. Many of these young men end up being baptized, serving missions, and going to college. Bob Roylance is now 80 years old. 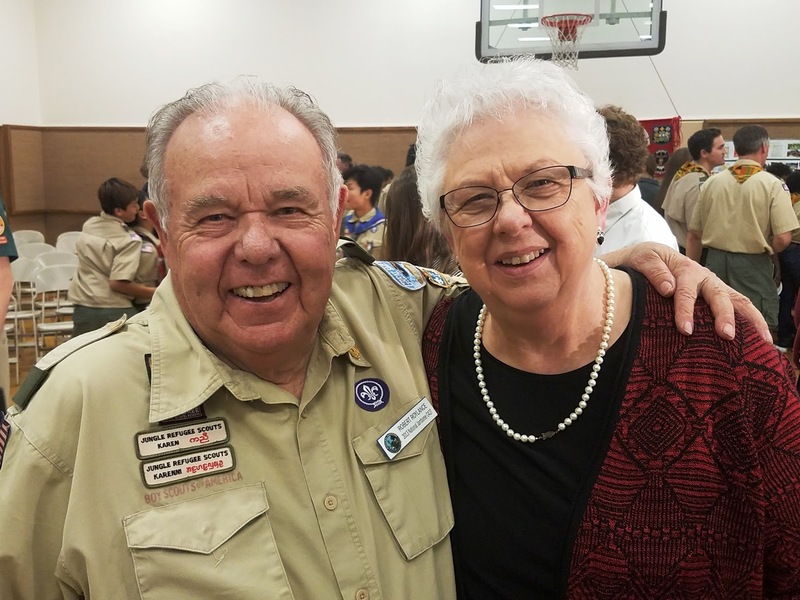 His career was in agriculture as a farm and ranch specialist working with LDS AgReserves properties. Much of Bob's time these days is spent trying to decipher Book of Mormon geography. He and retired BYU soil scientist, Richard Terry, have developed the "Pasión River Model" that places Nephi at Tzalcam, Baja Verapaz; Zarahemla at Seibal, Alta Verapaz; and Hill Cumorah on the Quintana Roo side of the Rio Azul (Rio Hondo). Now for the back story. While I (Kirk Magleby) was serving my mission in Peru from 1972 - 1974, I corresponded with Elder Milton R. Hunter of the Seventy, sharing some of the interesting things my companions and I were discovering on our P Days (the "P" stood for "preparation" in our era). Elder Hunter, whom President David O. McKay had designated the point man among the brethren for Book of Mormon studies, arranged for me to remain in South America doing research for 2 months at the end of my mission. During those 2 months, a "Book of Mormon" tour group visited Peru and I met Newell and Cora Gene Anderson from eastern Washington who had a strong interest in the Nephite scripture. A few years later I happened to meet the Andersons again along with their children and spouses at a hotel in Guatemala City. 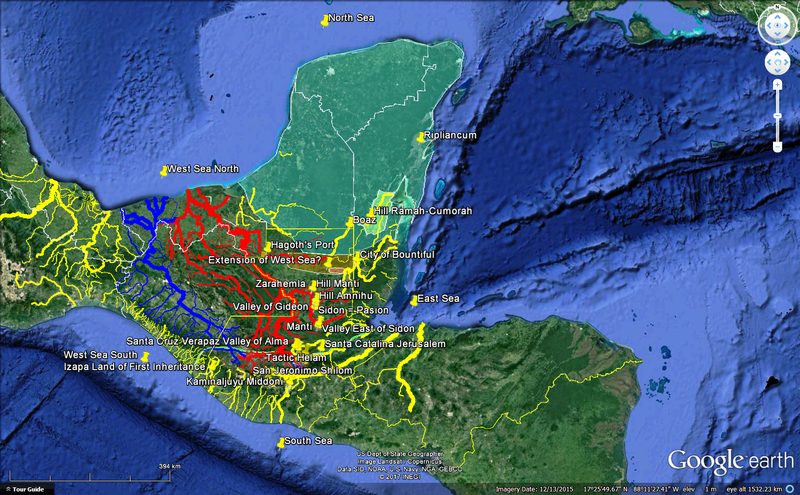 We visited archaeological sites such as Copan together for a couple of days. That was when I first met Susan Roylance, the Anderson's oldest daughter, and her husband, Bob. In 1978, Susan was the Republican nominee for US Congress from House District #4 in the State of Washington. She has played a significant role in women's, family, and health issues at the UN and globally for decades. This Deseret News article speaks to her effectiveness as an advocate for family-friendly causes in an often family-hostile political world. In retirement, Bob has helped impoverished farmers in Africa and elsewhere improve yields, build storage infrastructure, and develop viable cash crops. By 1982, Bob and Susan had moved to Murray, UT. I was working with John W. (Jack) Welch and John L. Sorenson getting FARMS up and running. Susan Roylance came on board to assist us with fund-raising. She was very helpful in those early days with branding and promotion. Susan guided us to polish the FARMS Newsletter (Insights, an Ancient Window) into an effective communication organ that soon began to reach thousands. Susan's mother, Cora Gene, now 94, lives with the Roylances. This evening I was privileged to update them on some of the exciting projects we are currently working on at Book of Mormon Central. Susan described a Book of Mormon drama she envisions by and for the Karen refugees she and Bob serve. The Book of Mormon is not yet available in the Karen or Karenni languages, but its powerful narratives have universal appeal. The closing prayer at tonight's Eagle Court of Honor quoted Mosiah 2:17 "...when ye are in the service of your fellow beings ye are only in the service of your God."